Liverpool striker Luis Suarez has won the Barclays Race for the Golden Boot ‘10-goal’ award after being the first player this season to reach 10 goals in the Premier League. On receiving the award Suarez was quick to praise Brendan Rodgers for the award — believing the ‘free number nine’ role the new manager has given him has made him so effective. Without Luis Suarez, who tops the scoring charts with 10 goals and also has two assists, Liverpool would be second bottom. They would only have one win to their credit instead of three and 10 fewer points. More worryingly, they would have lost 10 matches and be in real trouble. 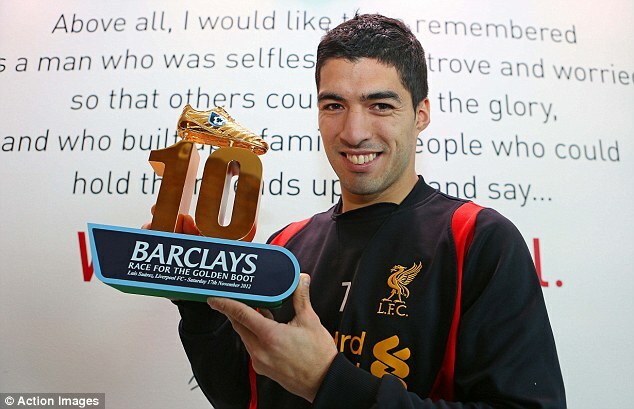 Suarez has earned Liverpool at least a point on six occasions in the league this season. Without the Uruguayan, Brendan Rodgers would be in serious peril. Opta statistics show United are just as reliant on Robin van Persie. Without the Dutchman, United would have just three wins instead of ten and seven draws instead of none. Their goal difference would be just +2 instead of a healthy +14 and they’d have half the points of bitter rivals Manchester City.